Yeah, that’s an official LC Subject Heading. Just a note on Boston and its fake stupid Patriot’s Day. Some of us had to work today. MBTA claimed to be running a Saturday schedule, but I waited more than 30 minutes on each end of my commute. So, Boston, you can take your holiday and shove it. Those of us north of the river would like to just go about our business if we don’t get to stay home. Man, I was gonna do dishes tonite in those 30 minutes. Katie scored some sweet tickets to yesterday’s game late in the afternoon. 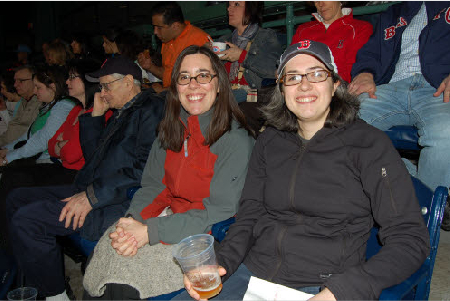 With such a spontaneous trip to Fenway, I had no fan gear. What? I’m wearing a cap? Um . . . well, the tickets were free and I really needed to wear something in support of the team, so I may have also accidentally swung by the team shop on the way in. Luckily it was a beautiful warm night. Plus, the Red Sox won! I haven’t gotten a new pair of glasses since moving east. So it was definitely time to get with the program. The Revolution provided scarves for the home opener. They also provided a win. Thank you and thank you, Revs. One more win for Sounders FC. I was hoping for three goals, but it was still a great game. Today I spent some time with little Crosby. I’ve renamed him Pocket Kitty. I just tuck him under my arm and go about my business. Grandma Linda and I took Oliver for a little stroll through the hallways. Sounders FC came in like a lion in their first MLS game. We’ll see whether it was just beginner’s luck as the season progresses. Okay, I must admit the jerseys aren’t the only green here. I am jealous. Seattle is crazy about this new team and I’m jealous. Even Mom is getting in on the action. The Revolution doesn’t compare. The games are great fun, but the crowd is small, with a few attendees always poking fun at the whole thing as they watch from their company’s free seats. 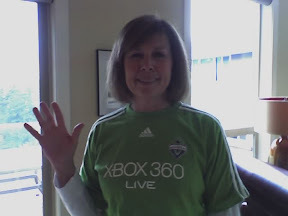 Lucky for me, I hope to take in a Sounders match when I am out west next weekend. But I’m still a Revs fan. I will not be joining in the craziness of St. Patties in the greater Boston area, but I did make green beer. Food coloring probably rots the cells in my body or something, but I have a bunch from making Christmas cookies and I’ve never had green beer. I feel like my mom used to make green pancakes or something for the holiday (is that true Mom?). You left coasters should also know that Boston celebrates Evacuation Day today, with some lucky folks getting the day off. What’s everyone else doing? Corned beef and cabbage? General beer drinking? Potatoes galore? Lincoln’s aunt Molly is in town while her folks are out of town. This means two furry beasts in the house. It also makes for some hissing and growling. Think they can work out their differences and become pals? My liquor cabinet was dry and it was time to resupply. I went to snag new versions of what was empty but stopped short when I saw the price. I couldn’t remember if I had really been paying that much for a bottle of bourbon, but the proof was right there on the price tag. So I let my eyes drift downward and recalled reading something about underrated cheaper liquor. I recalled the story well enough to remember Evan Williams being reviewed as the best, so I decided to try something different. Well, apparently I’m not the only one shunning top shelf choices. The New York Times reports that less expensive liquor is popular right now.